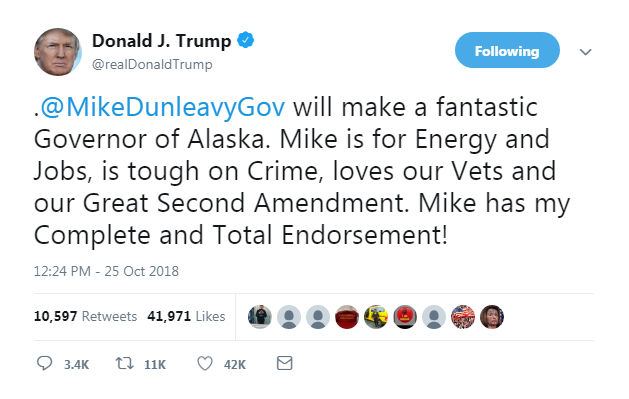 Republican candidate for Governor, Mike Dunleavy, received the mother of all endorsements this week. Love ’em or hate ’em, it doesn’t get more high level than this. Taking a page out of the POTUS playbook, Portugal. 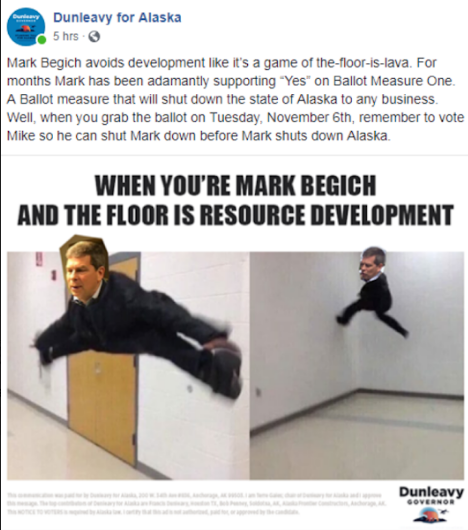 The Man, counter punched by flexing their Alaska cred on the heels of their endorsement of Democratic candidate Mark Begich. 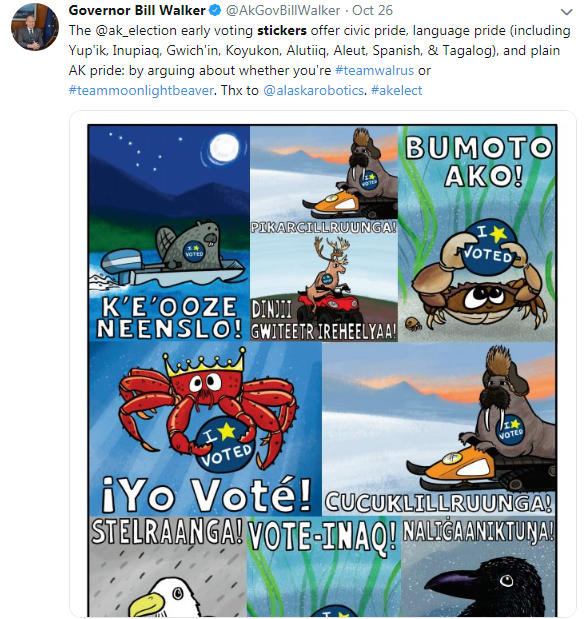 The two gubernatorial candidates rushed to Twitter to brag about their respective highest level endorsements. And then Secretary Hillary Clinton weighed in. 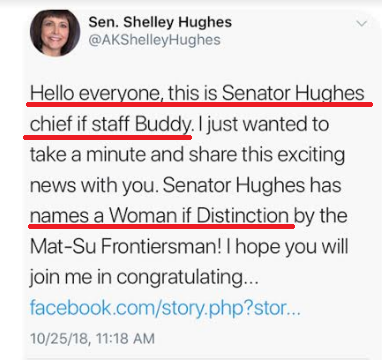 #ShesWithMark. 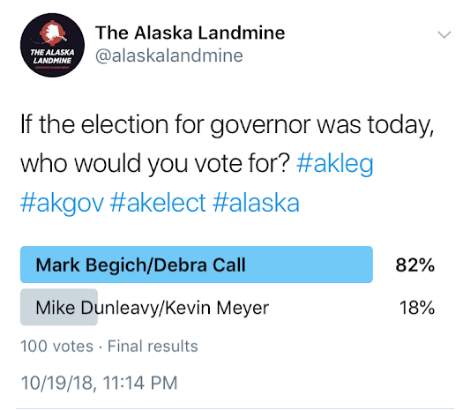 I looked all over Senator Begich’s Twitter and could find nary a retweet or even a like. 🤔 Poor, poor Hillary. She was just trying to help. Someone wasn’t too happy about the Portugal. The Man endorsement. 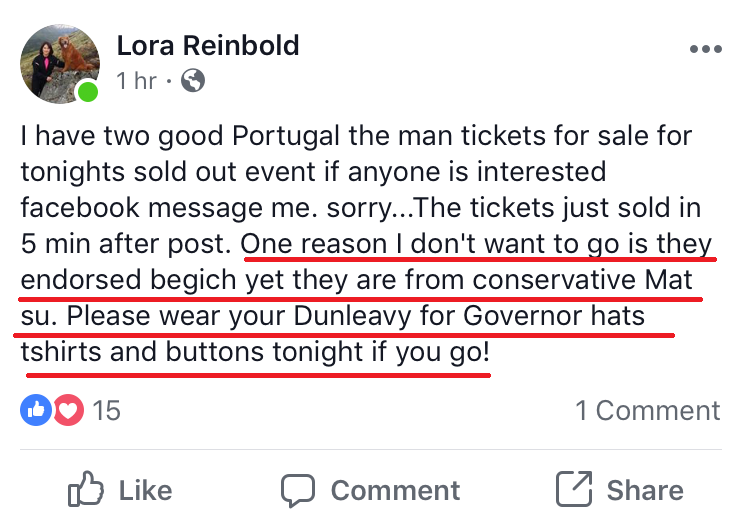 Too bad for Senator Representative Reinbold – she missed a great show. We love it when homegrown kids make it big, no matter their politics. From Bristol to Jewel, or Trajan Langdon to Portugal. The Man, we are fans of them all! 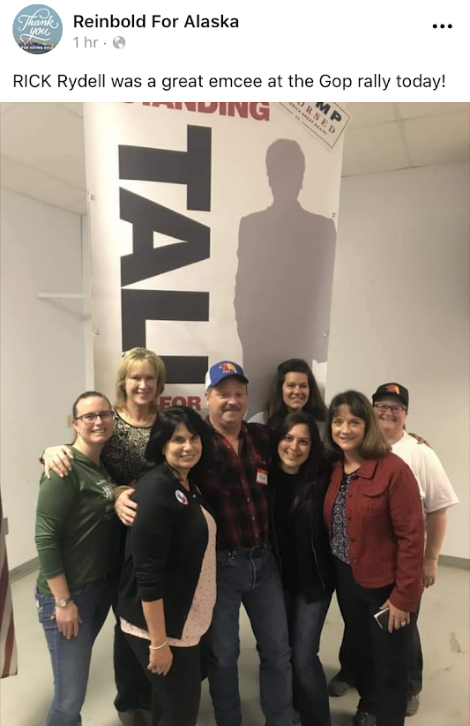 Running for Governor sure has its perks. 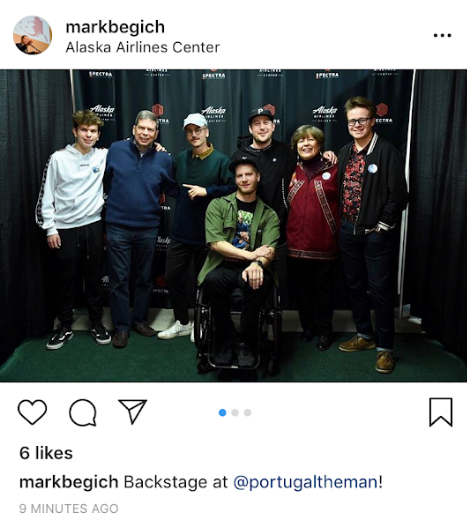 Mark even got to go backstage! Speaking of backstage, we heard Portugal. 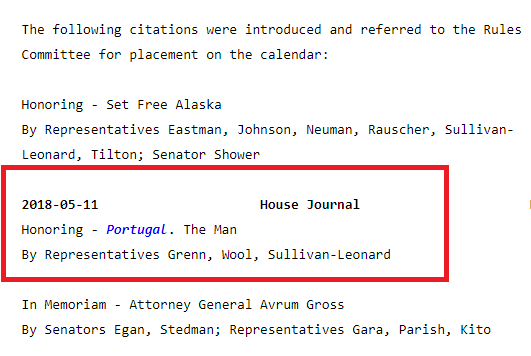 The Man finally received their Alaska legislative citation for winning a Grammy. Remember that from back in May? See who introduced that citation? Uh oh. Poor Representative Grenn has had a stretch of bad luck. 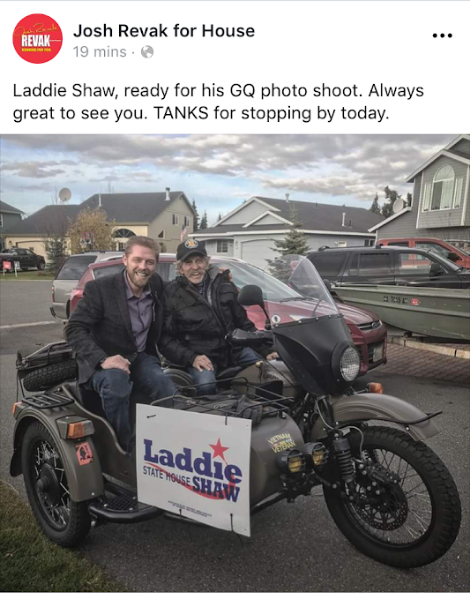 First, “staunch Democrat” Dustin Darden doesn’t drop out. Then, fellow Independent Governor Bill Walker does. Kind of. 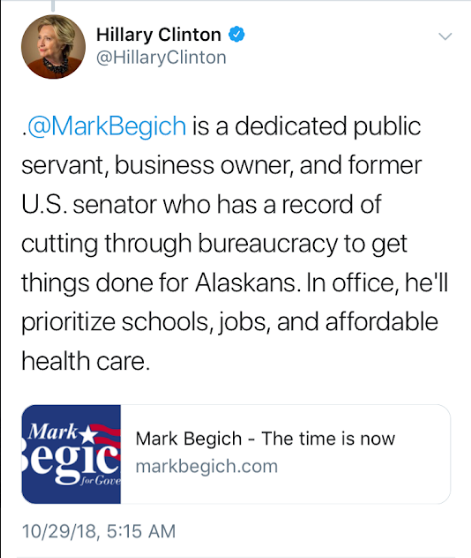 And then, he finally gets to present a nice legislative citation to a group of hometown heroes and right before it happens, they cause a big stir by endorsing Begich. It’s okay Jason: they say bad things only come in threes! Will Governor Walker be dressing up as a lame duck? Ba dum ching! I beheld the wretch — the miserable monster whom I had created. 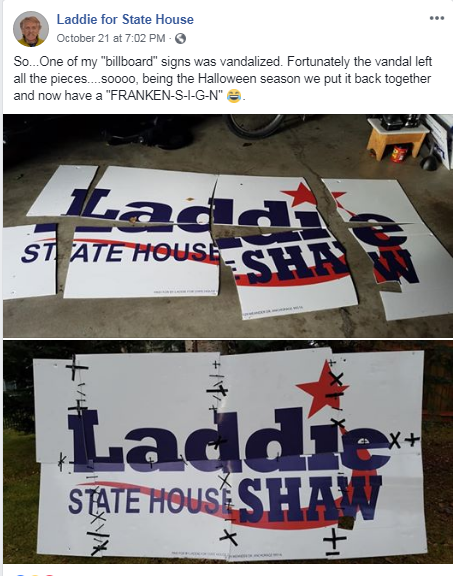 FRANKENSIGN! 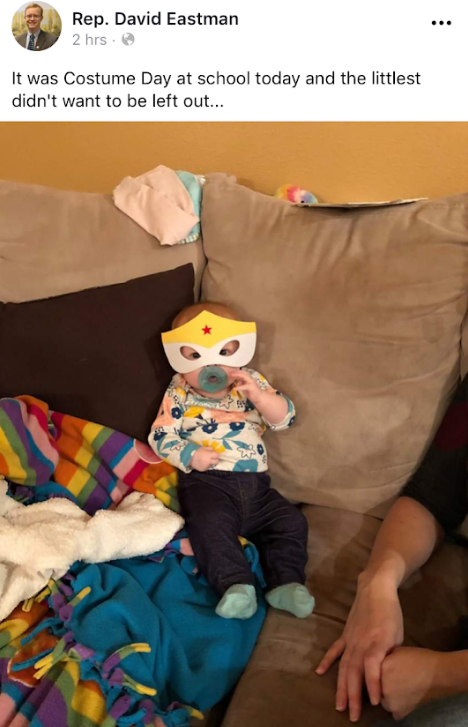 The cutest little PFD defender. We were concerned that Senator Micciche might use his trusty chainsaw to carve jack-o-lanterns. 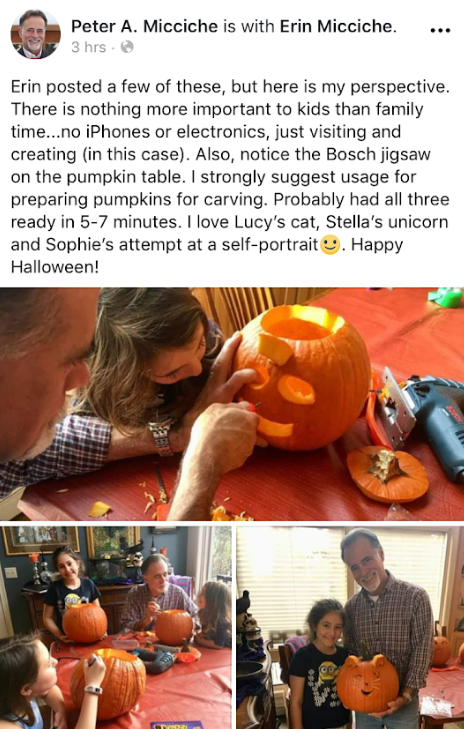 Happy to note he recommends the modest Bosch jigsaw for all your carving needs. 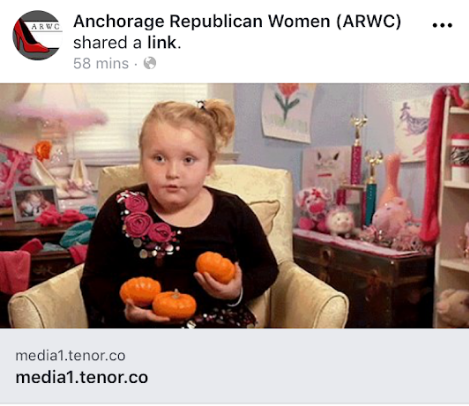 The Anchorage Republican Women’s Club shared this random gif of Honey Boo Boo juggling mini pumpkins with no context or caption. 🤣 We *think* they were trying to share someone’s recent Facebook shout out to some hard working ladies and just epically failed. Or maybe they really like Honey Boo Boo? 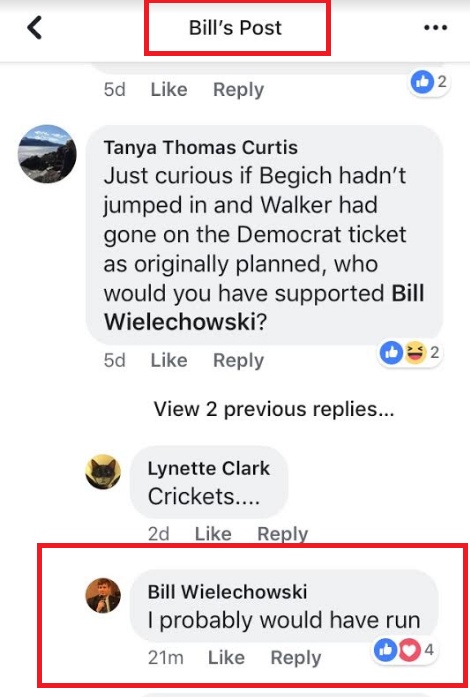 Did anyone else see this hidden gem from Senator Bill Wielechowski? 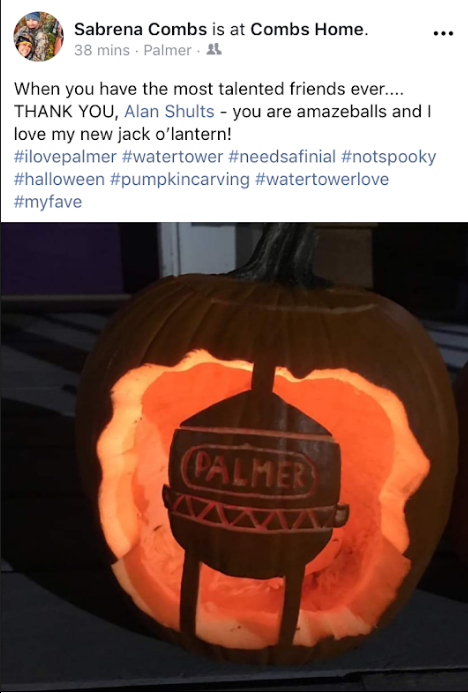 We almost included it in our Halloween round up. 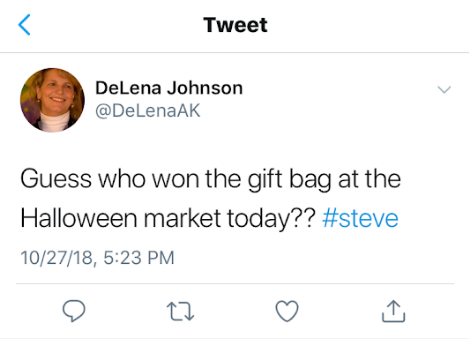 You know, because of all those skeletons. Maybe next time, Bill! Only 55 days until Christmas! To make it easy on Santa, we’ve started our very own “Naughty List.” Don’t forget to send us your recommendations. First up: these awful people. 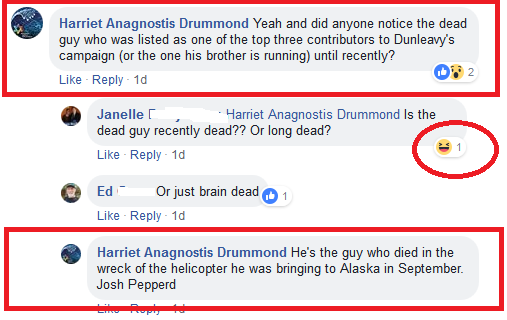 Although she has since taken it down, we have to call out Representative Harriet Anagnostis Drummond for this post. Harriet, what were you thinking? Beyond the pale. 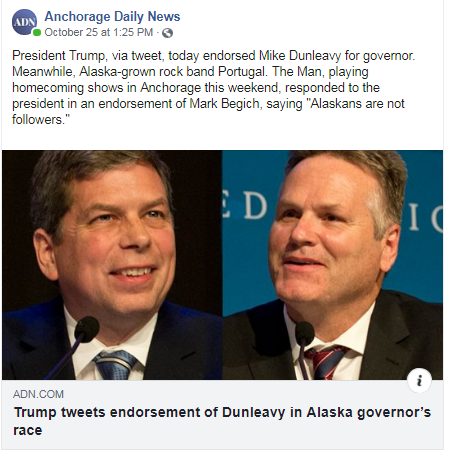 The Dunleavy IE, Dunleavy for Alaska, for using Senator Bill Wielechowski in a pro Dunleavy ad without his permission, and despite repeated attempts to get them to stop. They even photoshopped Jeff Landfield out (and then added him back in) of a picture of the three of them to make Mike and Bill appear chummier. Kinda gross. Guys, is it really worth it? It’s not even that great of an ad. 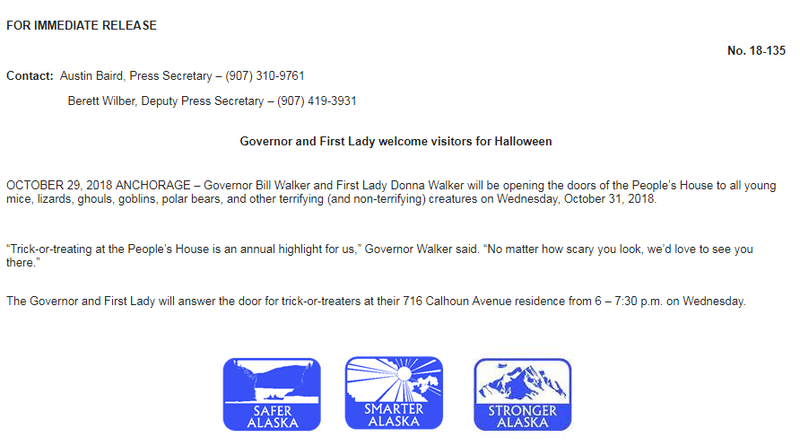 Unite Alaska for Walker Mallott for their ad (which we won’t link to) politicizing the tragic death of Bree Moore. 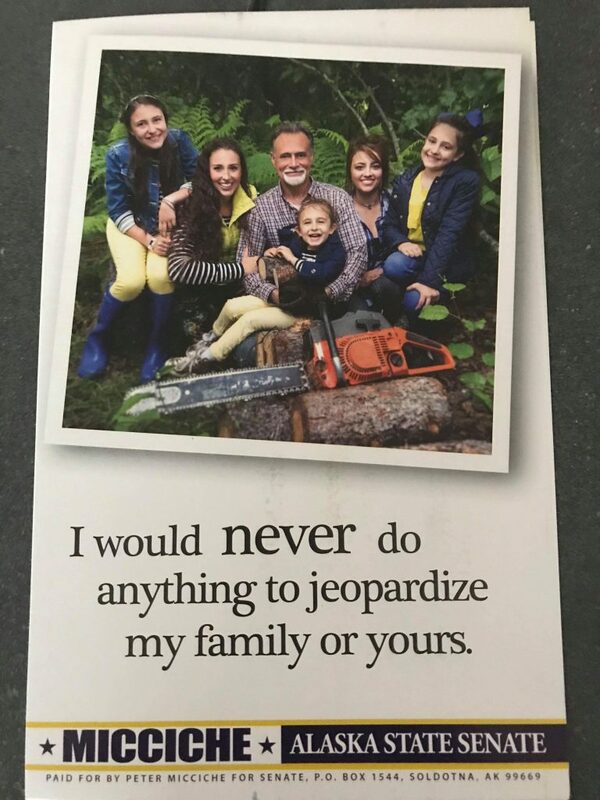 Bree’s parents, Butch and Cindi Moore, asked Unite Alaska to add a disclaimer, plainly stating the Moores were not affiliated with the group or the ad. That didn’t happen. Unfortunately, when it comes to political ads, this is not the first time that the families of victims wishes have been ignored. Isn’t that right, Representative Tarr? 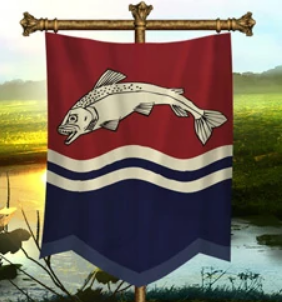 There’s been some discussion that candidate for House, Sara Hannan, might have borrowed her campaign sign logo from House Tully of Game of Thrones. Anyone else see a resemblance? 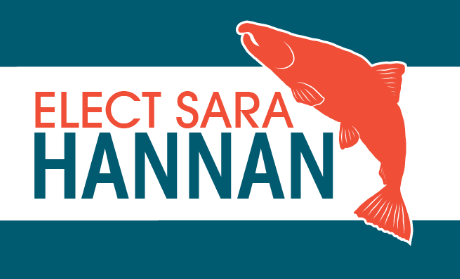 If Sara is a Tully, what does that make her opponent, Independent Chris Dimond? 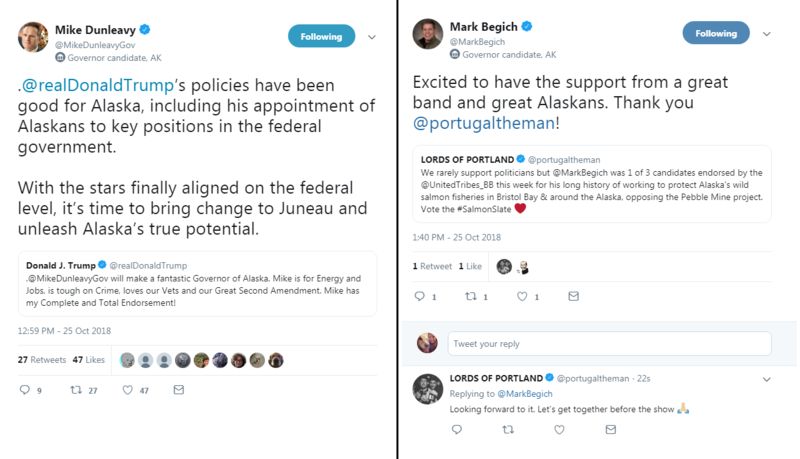 This isn’t the only Game of Thrones connection to hit Alaska politics. 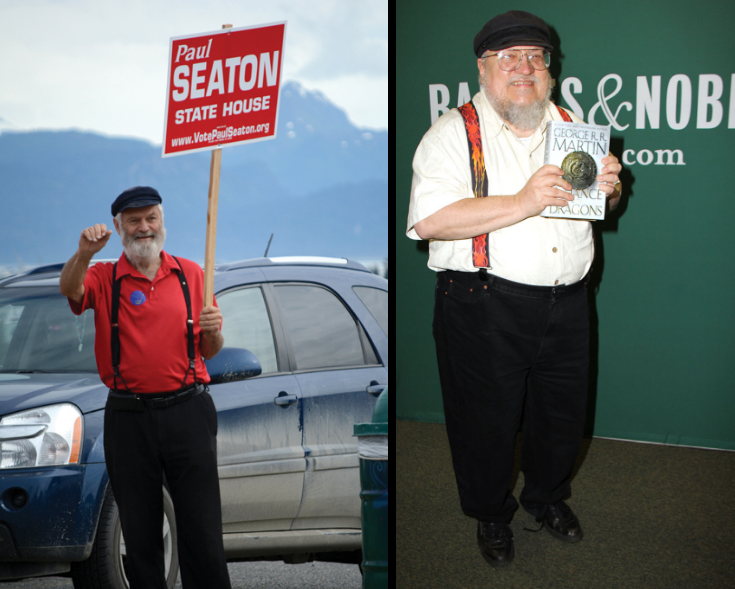 Don’t forget author George R. R. Martin’s doppelgänger, Representative Paul Seaton, is running for reelection in District 31. No matter who wins this election season, winter is coming. 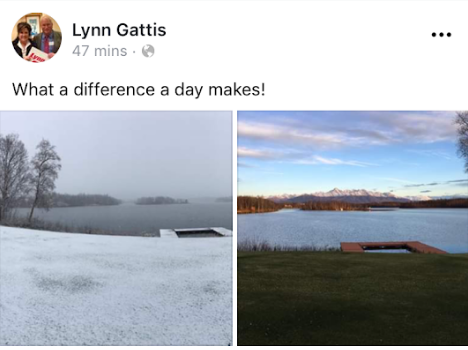 In southcentral Alaska it came Sunday. Let’s hope it only lasts about 6 months and not 6+ years! The Stalker’s Representative, Jennifer Johnston, enjoyed the fresh snow with family. 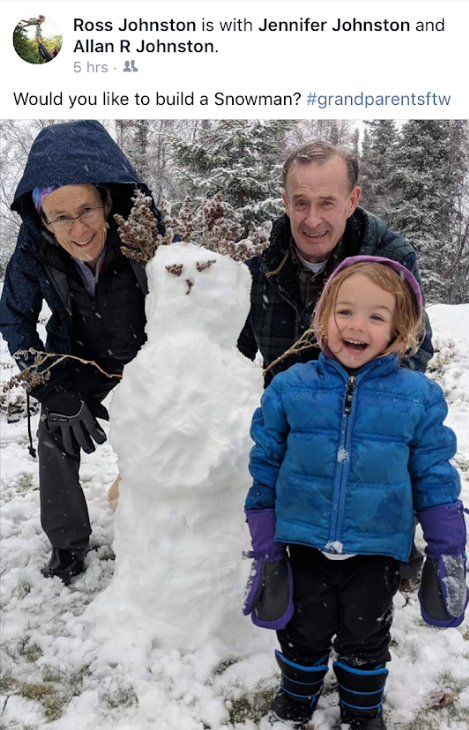 What would it take for her to build a snowman with another little constituent a few streets over? 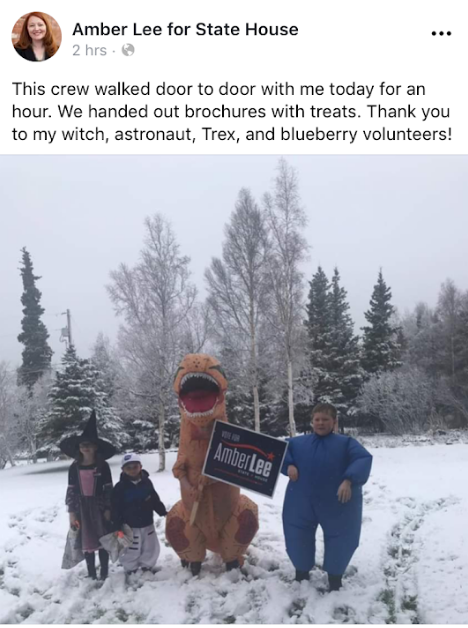 Not to be outdone, Jennifer’s opponent, candidate for house Amber Lee, walked door-to-door with costumes and treats during winter’s first storm. 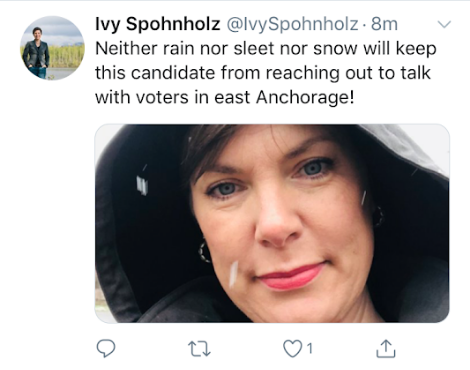 Representative Ivy Spohnholz, channeling our great postal employees, also braved the elements to go door-to-door. Way to go ladies! 💪 Seems like the guys stayed at home. 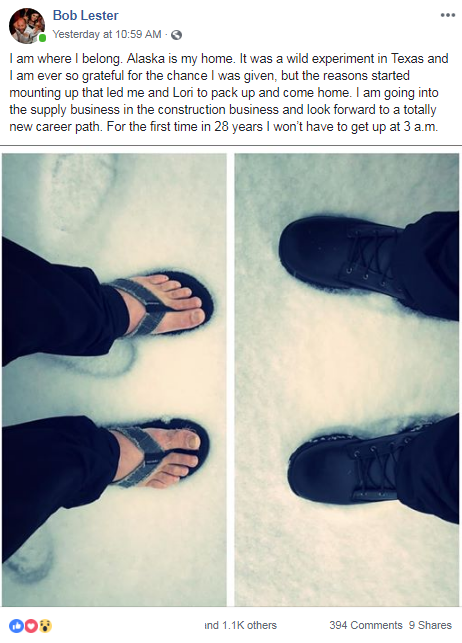 Maybe we should blame the start of winter on snow temptress Assemblymember Christopher Constant and his Facebook post goading Mother Nature. Back when I was a kid, it always snowed before Halloween. Glad things are getting back to normal around these parts. 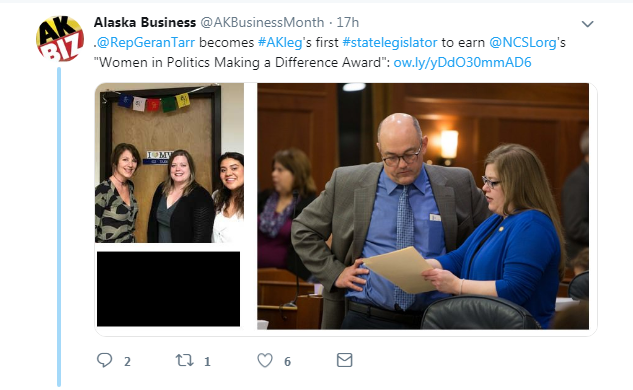 Congratulations to Representative Geran Tarr for becoming the first Alaskan honored with a “Women In Politics Making a Difference Award” by the National Conference of State Legislatures. Who memed it better? The Dunleavy IE? This might be our favorite election post so far! So many layers of cleverness. Cheers to you, Pat! What’s up with the Mi 🐤 🔑 sign in this photo? 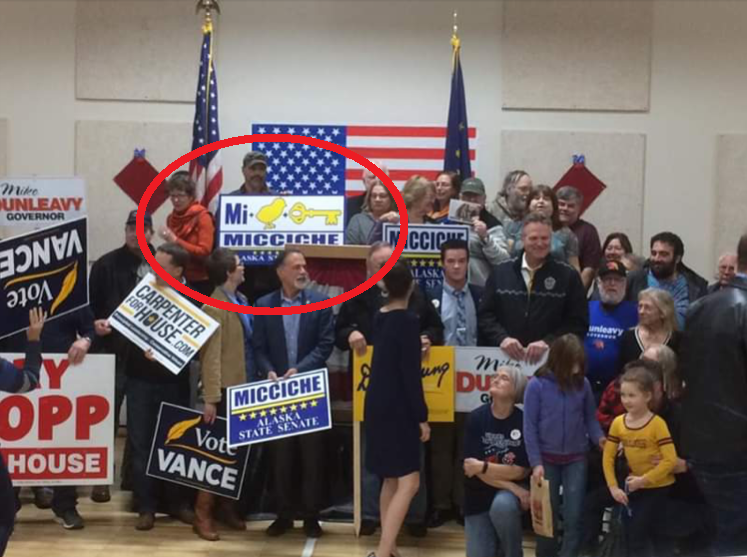 Not sure Senator Miccichi needs anything other than his name (and maybe an “I’m sorry”) on his signs. In the spirit of fairness, we designed a custom sign for write-in opponent Ron Gillham. 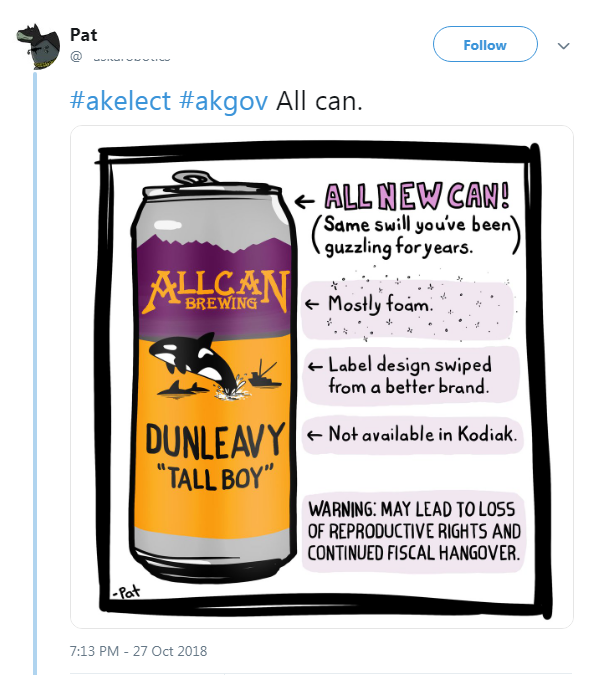 We think this could really take off on the Kenai. Morning conservative radio talk show host, Rick Rydell, in his element at a GOP rally. 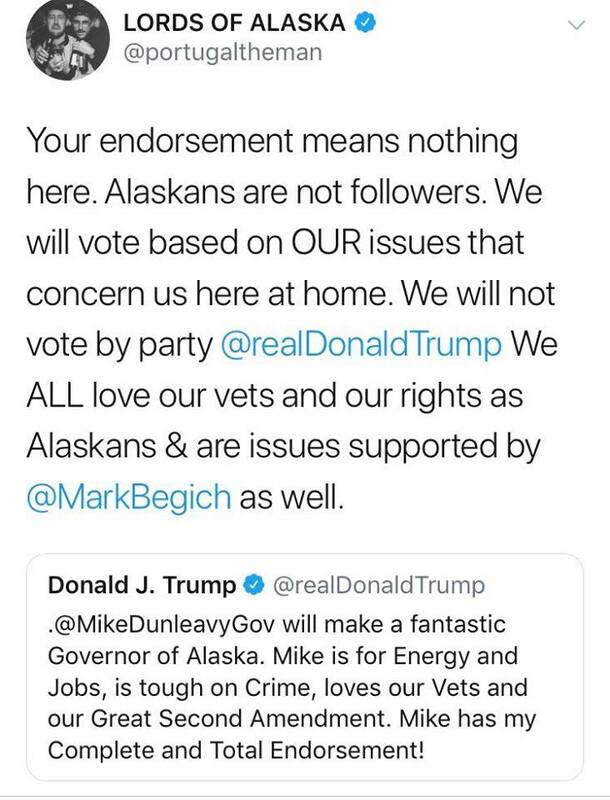 Is that part of a “Trump endorsed” sign I see stuck to the Standing Tall for Mike Dunleavy pop up? That was quick. Speaking of standing tall, it’s no secret former (and about to be future?) Representative Nancy Dahlstrom is tall. But Holy Paul Bunyan! I guess I need to meet her in person because I had NO IDEA she was that tall. 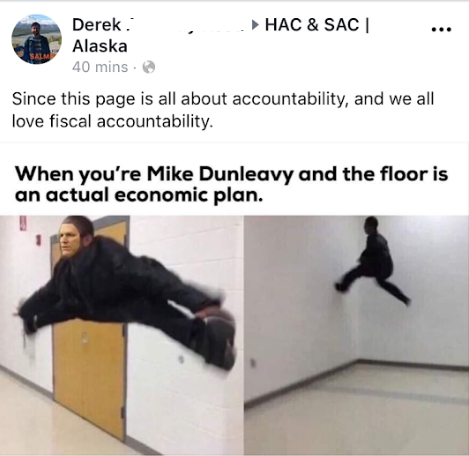 If you’ve ever met Senator Mike Dunleavy you know what I mean. If you’re wondering about Assemblymember Amy Demboski’s handshake reference at the beginning of the previous post, here you go: Governor Walker’s press secretary, Austin Baird was the object of a detailed handshake critique from the Assemblywoman. Austin’s retort to Amy proved to be much stronger than his handshake. He’s not wrong. All the precincts but one agreed! We were very confused to see the recent Anchorage Assembly vote on the APD headquarters passed 10 to 1, with all members voting. We assumed (correctly) that Assemblymember Amy Demboski was the lone no vote. But, after seeing this photo on Facebook that night, we had to check how it was possible that all Assembly members were able to vote. 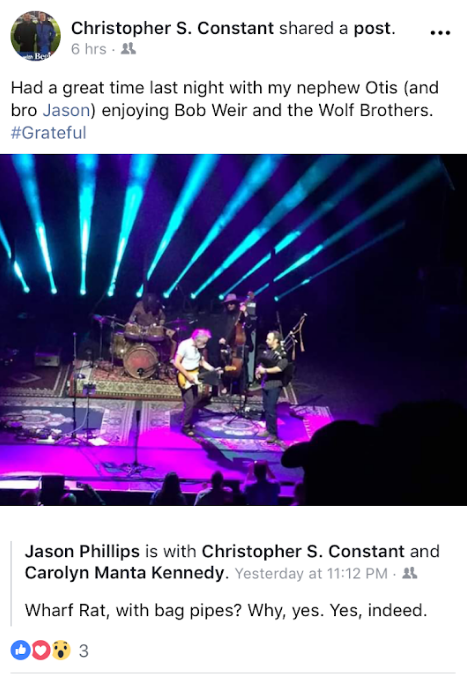 Looks like Assemblymember Christopher Constant called in to make the vote from a Grateful Dead concert in Seattle. Now that’s dedication. The best part? We’re told he was there with his 16-year-old musician nephew. What a rad uncle. LADDIE THE LEGEND. 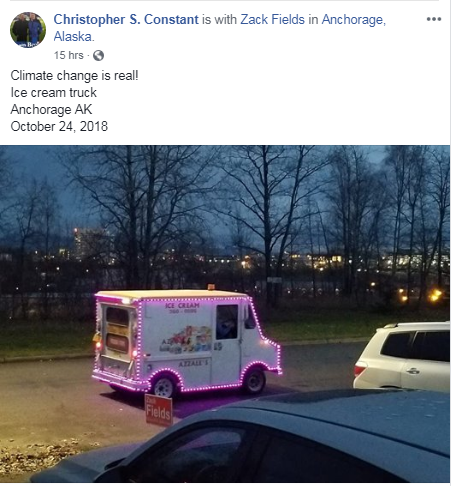 Photos like this are why the Alaska Stalker exists. Let’s see if both these badass vets can ride over the finish line. Laddie, where’s my ride? 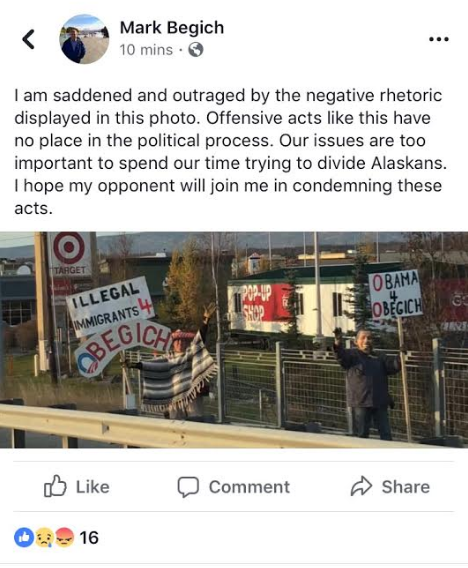 Speaking of Veterans running for office, have you seen this video from Democratic candidate for Senate, Oliver Schiess posted on the Alaska Democrats Facebook page? I bet it raised some eyebrows. 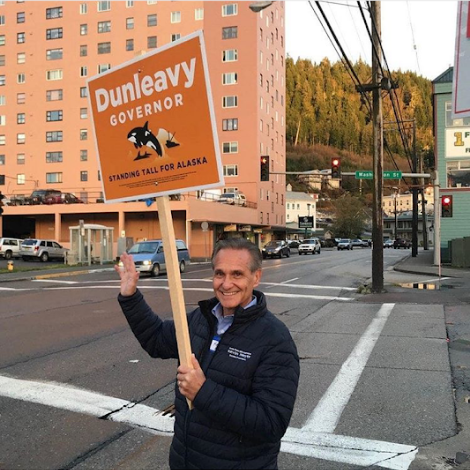 He’s an Eagle River Democrat, alright! 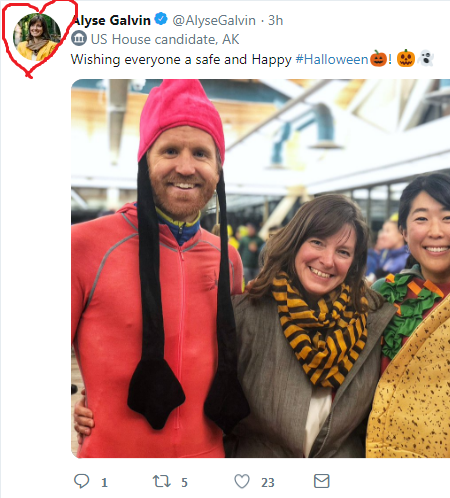 We admittedly don’t know much about Fairbanks politics, but can candidate for House, Bart LeBon, please win his race? 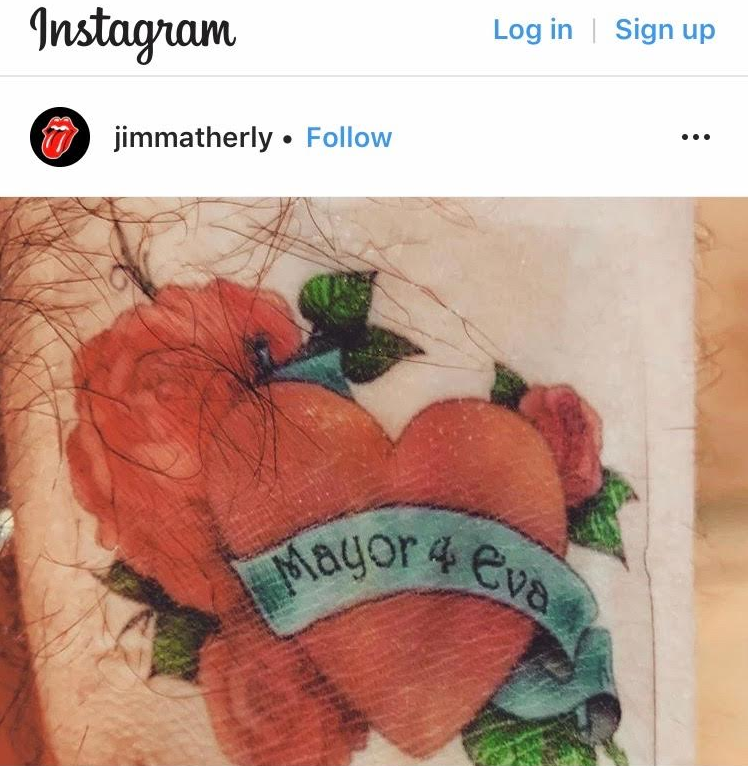 He’s hilarious and has some of THE BEST social media we’ve seen. Good luck, Bart! 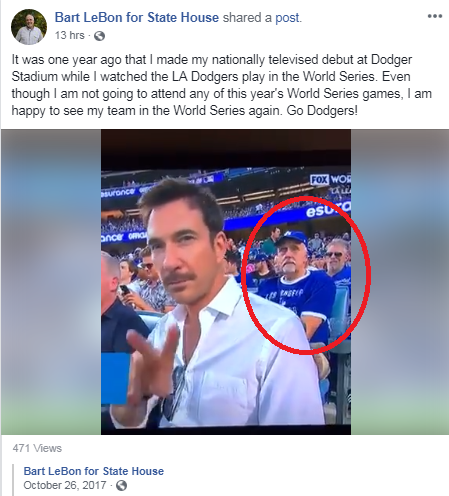 And, sorry about your Dodgers. Maybe 2018 will be *your* year instead. Can we all just admit the jig is up with the whole “independent” thing? They can’t all be gems. What does this even mean? Good catch, Ben. 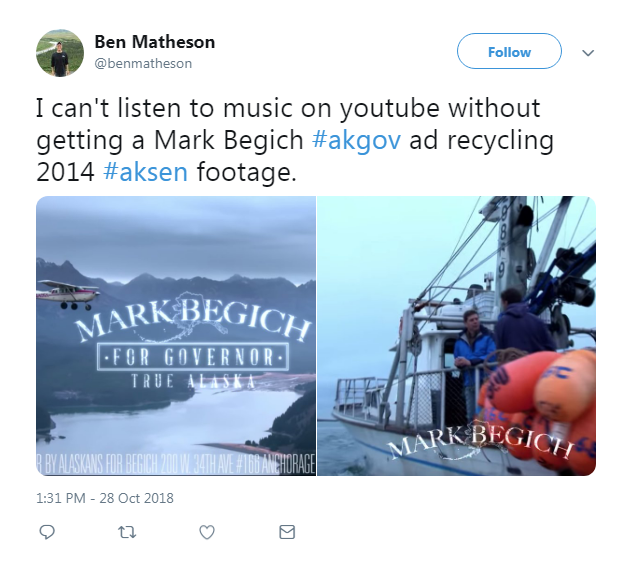 We’ve also noticed Senator Mark Begich recycling and reusing campaign footage from his senate campaign this election season. Gotta keep those environmentalists happy! 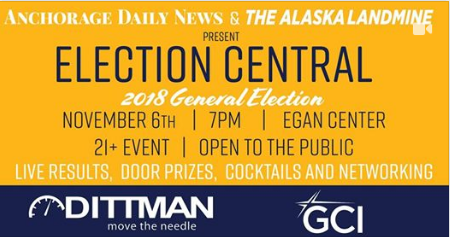 Join Anchorage Daily News, GCI, Dittman Research, and The Alaska Landmine at Election Central for the General Election on November 6, 2018. The party starts at 7pm at the Egan Center. This is a 21+ event and is open to the public with free entry. If you can’t make it, don’t forget to watch our high energy live stream on Facebook! Rick Rydell: Do you have a Facebook page or campaign page? 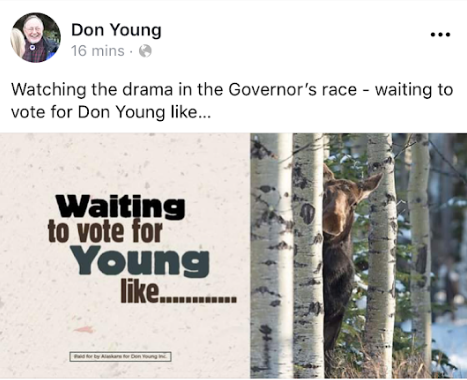 Tipster in email: I didn’t have the heart to tell him it was a Dunleavy for Governor hat. Anchorage Mayor Ethan Berkowitz at SEATAC, flying back to Anchorage. Senator Bill Wielechowski serving (no, seriously) Cale Green at the Dunleavy for Alaska IE headquarters. Congressional Candidate Alyse Galvin driving her RV in Midtown on the first snow day of the year. 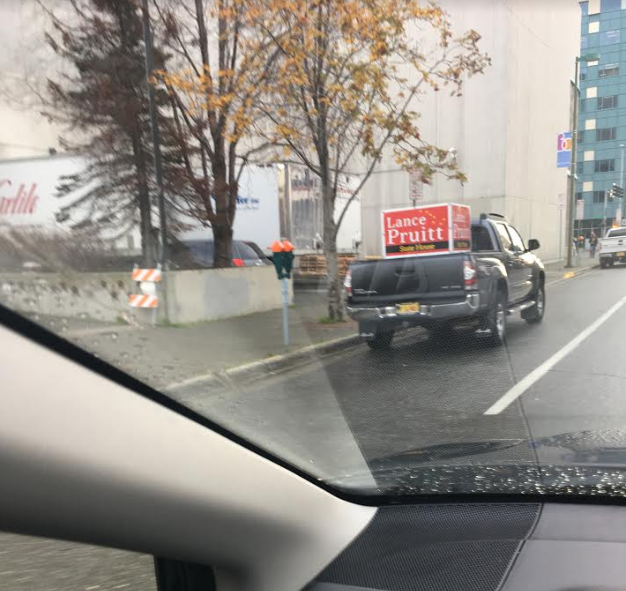 A new Representative Jason Green 4 X 8 was spotted downtown this morning on I Street, amidst dozens of Yes on 1, Mark Begich, and Zack Fields signs. I’m sure he’s thrilled.